Karasuno High School is finally going against the undefeated Shiratorizawa Academy. With big expectations, Karasuno’s team is doing its best to keep their cool. Against Ushijima’s thunderous left-handed spikes, Nishi struggles to receive the unfamiliar attacks. Karasuno will need to give it their all to stop the climbing point gap. With the second set of the match underway, Karasuno’s attacks are ruthlessly beaten down by Shiratorizawa’s mid blocker, Satori Tendo. As the second set is wrapping up, Karasuno’s ultimate defense keeps the score at a stalemate, but Tsukishima finally gets the opening he’s been waiting for. Shiratorizawa's setter doesn’t seem fazed by anything, even losing a set. Meanwhile, Ushijima makes a comment to Hinata that only serves to get him more fired up! 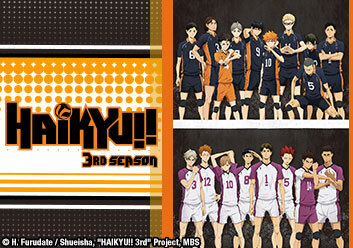 After a reminiscence of their first days in the Karasuno volleyball club, the next set gets Daichi, Suga, and Asahi reinvigorated! Ushijima and Satori's respective volleyball motivations are revealed. When Kageyama's exhaustion sets in, it may just be time for a little refreshment. An injury takes a player out for the time being, leaving Karasuno to push forward with risky attacks. Ushijima realizes something about Hinata. Karasuno is put a difficult position when Shiratorizawa gains the upper hand. As the match continues, the players give it their all! Two different teams with two different methods are at the final skirmish. Who will come out victorious in this fierce battle between strengths?